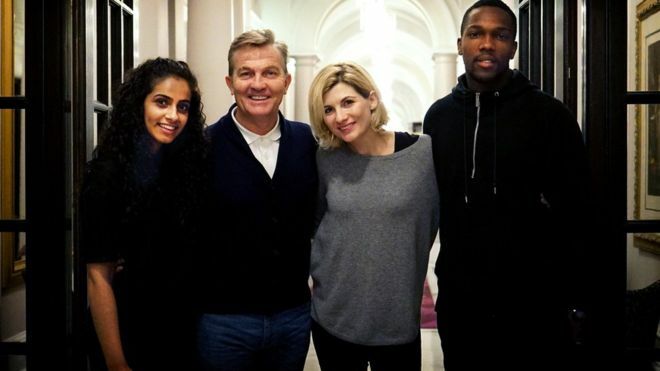 Today BBC have announced that when Jodie Whittaker takes over as the Thirteenth Doctor on the worldwide hit show in Autumn 2018, she will be joined by an all new regular cast including Bradley Walsh, Tosin Cole and Mandip Gill who will line-up as the new regulars on Doctor Who. This has finally confirmed the rumours that have been circulating the press and internet forums. Bradley will star as Graham, Tosin will play Ryan and Mandip will play Yasmin. Also joining the series in a returning role is Sharon D Clarke. The new head writer and executive producer Chris Chibnall who Bradley worked with on Law & Order UK made the decision to cast the first ever woman in the iconic role, and is also shaking up who will travel with the Doctor in the TARDIS, with a team of new characters. It is confirmed that the new series will be a ten week run of fifty minute episodes, kicking off with a feature length hour for the first episode. Bradley had already had experience of the extra terrestrial experience playing the characters “Spellman”, “Odd Bob” and “Pied Piper” in Dr Who spin off Sarah Jane Adventures.